Books set in future dystopias are all the rage right now. Usually society has become degenerate and evil, with a veneer of civility and promise. Only angry hormonal teenagers who are in love with multiple people at once can see the cracks in the facade! What do you do, though, if a slightly younger reader doesn’t like romance, and isn’t angry, and would rather not believe that human beings are innately evil (except for a chosen angsty few)? Give them this book. Henrietta isn’t a very good student, and she isn’t a very popular person. She just gets by, sort of, in her elementary school classes, and at home. Her grades and whereabouts are continually broadcast to her parents via their phones, children log in and out of their classrooms and bus seats, and hyper-safety and technology are prized above all else. Not horrible; not exciting; not memorable. Henrietta’s non-safe and non-technological adventure starts when she discovers a trapdoor into her attic, and within the attic, a wild housecat. This first foray into the unknown leads her to form friendships with two other unusual children and, with them, into an exploration of the history of her town, and the town’s putative guardian, the frightening Wikkeling. A truly original book, scary without being gruesome and showing a believable, realistic society only one step from our own, this book is highly recommended for children in late elementary school. Today, Sarah shares the book Brother William’s Year by Jan Pancheri. When 10-year-old Peter is sent to the market in Baltese he is meant to use the single coin in his pocket to purchase fish and bread. That particular day, however, there is a fortune teller’s tent at the market. Peter finds himself repeatedly walking past the tent and he finally decides to spend the coin on a fortune. He is allowed one question and without hesitation he asks about his lost, and perhaps dead, sister. He is told that indeed his sister lives and that an elephant will lead him to her. What a preposterous idea! Not only is it winter in Baltese, but there is certainly not a single elephant anywhere nearby. But life is always changing and sometimes remarkable things happen. 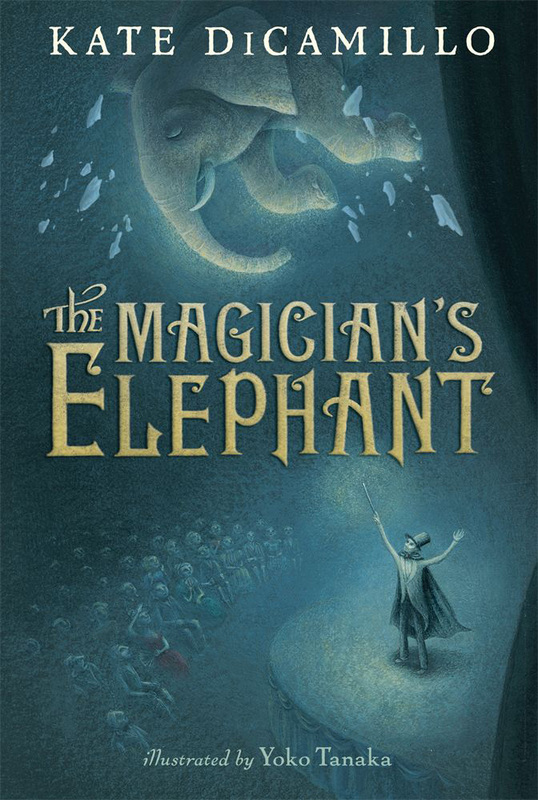 During a magic show at the opera house a magician intends to conjure up a bouquet of lilies but he causes an elephant to come crashing through the ceiling instead. An elephant in Baltese! What if the fortune teller could have been right? The appearance of the elephant sets a series of seemingly unrelated events in motion involving several people from the town of Baltese. How can a displaced elephant possibly help Peter find his missing sister?? Sometimes remarkable things happen. This heartwarming book promises to leave the reader with the feeling that indeed life does change and that one should never give up hope because sometimes remarkable things do happen. Kuplink, Kuplank, Kuplunk! 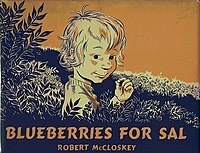 It’s blueberry picking time, and that reminds me of one of my favorite childhood books, Blueberries for Sal. In this classic tale, Little Sal goes blueberry picking with her mother. Little Sal actually does more eating of the blueberries than picking while her mother does most of the work. Her small bucket makes a kuplink, kuplank, kuplunk sound because there are never very many berries in it. Along the way, she gets tuckered out and stops to eat some berries. However, when she goes to find her mother, she accidently follows a mother bear that is out eating berries with her baby bear. Little Sal’s mother makes a strange and surprising discovery as well. All ends happily for the mothers and their little ones. If you love blueberries as much as I do, this is a good book for you. Nine-year-old Ellen and her mother have to leave their farm and go to live with her mother’s sister in Toronto. Her father left the farm to look for work when the drought made it impossible to earn a living on the farm. In Toronto, they are lucky because Aunt Gladys owns a boarding house and can afford to keep them. Ellen’s mother finds a job and Ellen helps her aunt with chores and is given the responsibility of tending the chickens just like back home. Ellen is happy here but she misses her best friend and she is too shy to make friends with the neighbor children. She discovers that she can go out on the roof from her room and then out onto a tree branch and hear what the children are saying and watch what they are doing. One night, however, she hears men talking and realizes that they are planning to get the neighbors evicted so that one of the men can buy the house cheaply. This revelation motivates Ellen to meet the children next door and to help them devise a plan to keep the house. Ellen is likable and the children are charming. The inhabitants of the boarding house are kind and interesting. In this present time of economic challenge, it is interesting to see what people coped with during the Great Depression and see how these children took active roles in helping their families. With this book, it’s all in your perspective. 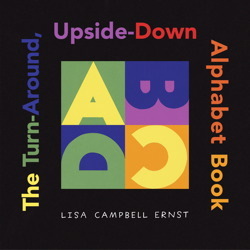 This very clever alphabet book takes the letters of the alphabet and turns them up and down and sideways and all around to create different pictures with each letter. For instance, an A becomes a bird’s beak when on its side, a drippy ice-cream cone when flipped upside down, and a point of a wishing star; J turns into an elephant’s trunk, a candy cane, and a monkey’s tail. Some letters take some real imagination to visualize and definitely stretch the minds of little ones and grown-ups alike. This book is sort of gymnastics for the imagination, and I think lots of kids 5 and up will really love it!